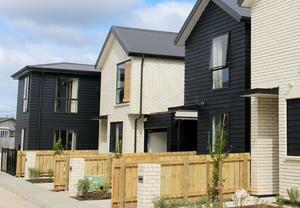 “The first quarter was a story of the ascendance of 40Gb Ethernet." The worldwide Ethernet switch market, covering layers 2/3, totalled US$5.4 billion in the first quarter of 2015 (1Q15), representing an increase of 1.4 percent year over year and a decrease of -13.8 percent quarter over quarter. Meanwhile, the worldwide total enterprise and service provider router market continues to rebound from recent year-over-year declines, growing 7.7 percent year over year, although declining -8.3 percent sequentially. From a geographic perspective, IDC reports that the 1Q15 Ethernet switch market results was Asia/Pacific (excluding Japan) (APeJ) was also flat, recording year-over-year growth of 0.1 percent in 1Q15. “The first quarter was a story of the ascendance of 40Gb Ethernet,” adds Rohit Mehra, Vice President, Network Infrastructure, IDC. “As other market segments declined due to general economic softness factors and the normal first quarter seasonality, powerful growth in the 40GbE segment lifted the overall market. “1Gb and 10Gb Ethernet should see a rebound in the second quarter given the increasing demands on enterprise networks from core to edge, but the strength of the 40Gb segment demonstrates the ongoing growth of large-scale public and private clouds." IDC reports that 10Gb Ethernet switch (layer 2/3) revenue decreased -2.9 percent year over year, coming in at just under US$2.0 billion while 10Gb Ethernet switch port shipments grew a robust 23.9 percent year over year with nearly 6.3 million ports shipped in 1Q15, as average selling prices continue to fall. In addition, 40Gb Ethernet now accounts for over US$500 million per quarter in revenue for the second consecutive quarter, growing 88.0 percent year over year. Going forward, 10Gb and 40Gb Ethernet are expected to continue to be the primary drivers of the overall Ethernet switch market moving forward. The worldwide enterprise and service provider router market increased 7.7 percent year over year in 1Q15. However, performance of the key segments within the router market varied widely with the larger service provider segment increasing notably at 9.9 percent year- over year, whereas the enterprise segment stabilised from recent declines, growing 1.3 percent year over year. From a vendor perspective, Cisco saw a strong 1Q15 in L2/L3 Ethernet switching that led to 5.5 percent year-over-year growth as its market share rebounded to 62.4 percent from 60.5 percent in 4Q14. Cisco's share stood at 60.0 percent in 1Q14 and in the hotly contested 10GbE segment, the company held 61.1 percent of the market in 1Q15, up from 58.7 percent in the previous quarter, and slightly down from the 61.8 percent held in 1Q14. 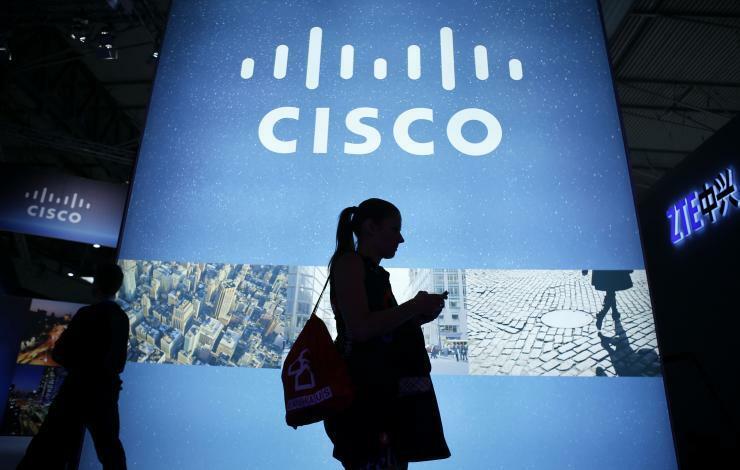 Cisco's service provider and enterprise router revenue increased 10.3 percent year over year. 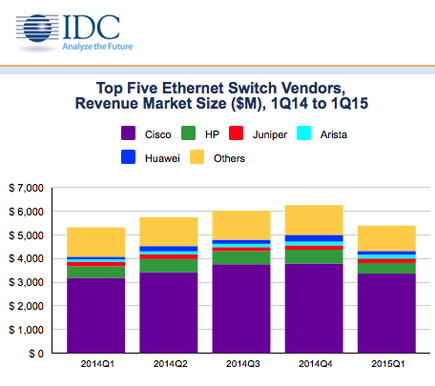 HP's Ethernet Switch revenue decreased -6.4 percent year over year and -23.2 percent quarter over quarter in 1Q15. HP's market share in switching fell to 8.3 percent from 9.4 percent in 4Q14 and also from the 9.0 percent share seen in 1Q14. Juniper experienced a down quarter in Ethernet switching with a year-over-year decline of -6.4 percent in 1Q15, while rising 1.5 percent sequentially. Its router revenue declined year over year for the third consecutive quarter, falling by -9.7 percent on a year-over-year basis. “Falling switch port prices dampens overall market growth, even as port shipments, especially for 10Gb and 40Gb Ethernet, steadily increase,” adds Petr Jirovský, Research Manager, IDC's Networking Trackers Group.